For 18 years Jill Rowley was a quota-carrying sales rep who launched herself into cloud computing sales by joining Salesforce in the early years and then moved to Eloqua in 2002 before Oracle acquired them. Today, Jill is the Chief Growth Advisor at Marketo -- talk about a BIG pivot from team red to the team purple. But with Jill’s success has come many trade-offs. She’s been fired twice, battled (and overcame) addiction, and her incredible sales success has come at a cost emotionally that she openly shares on this podcast with me. How did I meet Jill? She was my Eloqua sales rep in 2002, 16 years ago back when I ran Marketing at Ellie Mae. If it wasn’t for Jill, I really don’t know when my journey into MarTech would have officially started. I consider her one of the best sales people I’ve ever met and partnered with. 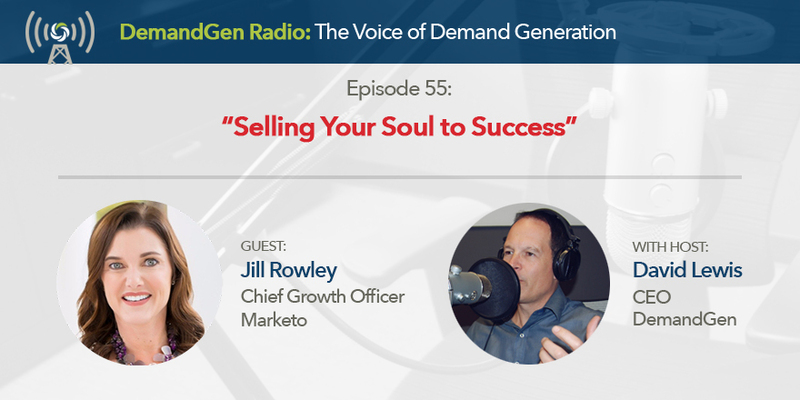 Whether you like Jill or not, her 40,000 followers on Twitter, and 210,000 followers on LinkedIn tune in to what Jill has to say and I know you'll get a lot from this episode with the former “Eloqueen."